Late during the summer of 1914, train stations all over Europe echoed with the sound of leather boots and the clattering of weapons as millions of enthusiastic young soldiers mobilized for the most glorious conflict since the Napoleonic Wars. In the eyes of many men, pride and honor glowed in competition with the excitement of a wonderful adventure and the knowledge of righting some perceived infringement on the interests of their respective nation. Within weeks however, the excitement and glory gave way to horror and anonymous death, brought on by dangerous new machines of war which took control of the old fields of honor and turned them into desolate moonscapes littered with corpses and wreckage. This new great war, called World War One, began as a local confrontation in Southern Europe, when Arch Duke Ferdinand was assassinated but eventually plunged the world in to a worldwide struggle that produced two of the greatest bloodlettings in history; the battles of the Somme and Verdun. The western portion of this conflict took place mostly in Belgium and France, and started as a war of “grand maneuvers” as had been theorized before the fighting began. But when more troops were poured into an increasingly cramped area, there came a time when the armies could no longer maneuver against one another in any operational sense. When this happened, the armies involved began digging in the face of more and more lethal concentrations of firepower, and the war of the machines, gas and trenches had begun. These conditions triggered a complex and difficult to follow series of evolving battlefield tactics and technology. The Germans responded by creating what amounted to modern combined arms squad tactics, something their French and British opponents initially brushed off as infiltration tactics. After a long period of grim failure, the British managed the mass deployment of a new weapon called the tank, which also changed the nature of warfare and helped break the brutal deadlock of position warfare. The French adopted both of these methods and weapons, applying them is a combined form which appealed to the French leadership. It was however, Germany which finally succumbed to the drain of economic warfare, and by October of 1918, German field commanders declared that the war was militarily lost, and that a truce must be sought. From that point on, it was only a matter of time, and the end came on November 11, 1918. The Great War ended, having caused millions of deaths on the Western Front alone. Europe and the world would never be the same. Remarks of Ernst Junger, after a night march to the front line at Guillemont. Instead of supplying a list of losses, which are difficult to imagine, listed here is a percentage of a country’s population directly afflicted. 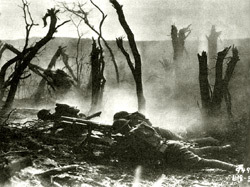 During the course of World War One, eleven percent (11%) of France’s entire population were killed or wounded! Eight percent (8%) of Great Britain’s population were killed or wounded, and nine percent (9%) of Germany’s pre-war population were killed or wounded! The United States, which did not enter the land war in strength until 1918, suffered one-third of one percent (0.37%) of its population killed or wounded.